All being well, Boatrocker will soon welcome the arrival of its Barrel Room and bar across the road from its Braeside brewery, which you can read all about here. The plan is to kickstart a massive barrel-ageing and sours program there while also opening the doors to the public so they can come and sample a wide range of trophy-winning Boatrocker beers at source. 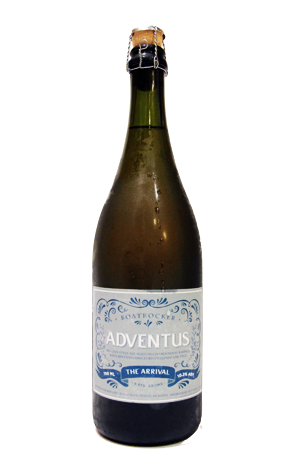 To mark said imminent arrival, the brewery has released a beer called "The Arrival" or, more specifically, Adventus. Originally bottled before last Christmas, head brewer Matt Houghton decided against releasing it then, despite its Christmassy name, and, like stablemates such as the Banshee barley wine, figured more time conditioning in bottle wouldn't do it any harm. Given it weighs in at more than 10 percent ABV and had brettanomyces bruxellensis added while it was spending time in Chardonnay barrels pre-bottling, there was certainly no hurry to get it out. But, ten months on, out it is – in rather elegant packaging: 750ml, corked and caged bottles with a label reminiscent of a French champagne. Golden in colour, there's something vinous about the aroma, which abounds with sweetness too: honeyed malts and candied apples and pears. The impact of the brett, with bruxellensis being a relatively mild strain, is limited with some prickly heat and smooth oak completing the picture in a beer that The Crafty Pint's founder's mum – not usually one to opt for beer over wine or G&T – declared: "Excellent."